Thank you for your patience,attention and kindness plus an excellent itinerary. What a glorious day! Thanks so much for a fabulous day! Our gelato bike ride was fabulous! Definitely one of the highlights of our recent trip to Italy. Our guides were knowledgeable, fun, and responsible; the bikes were of excellent quality and comfortable; the gelato was the best we have ever eaten (truly!). We look forward to coming back for another tour with Marco and Jodie in the near future. On behalf of Matt and myself, I wanted to send you both a personal email to thank you for the incredible 3 days we spent riding bikes throughout Tuscany. We are very grateful for the time and effort you put forth to make it such a memorable experience for us. As you could see from our enthusiasm in talking about the bike tours with random tourists at dinner, we even recruited 2 additional riders for the Chianti 2 ride last Friday! 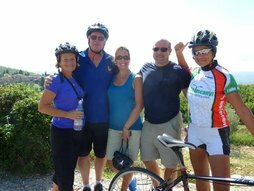 We will definitely reach out to I Bike Tuscany again when we return to Florence for our 10 year wedding anniversary, hopefully with some friends and family who will join us for the ride. If you are ever in NYC, please let us know. We'd love to meet up for dinner. Johanna and I want to let you know that we had a fantastic time today with Elena and Piero. 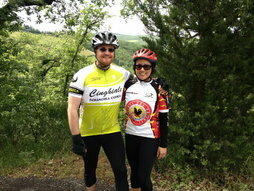 They catered the ride to our skill level and gave us a ride filled with amazing views, great food, and fantastic company. The equipment was first rate as well. 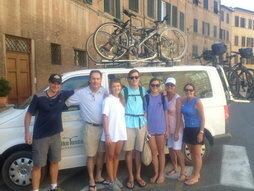 We will be sure to recommend your tours to anybody we talk to that is headed to Florence. 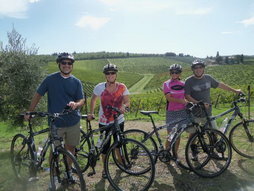 "We Bike Tuscany" exceeded our family's most optimistic expectations with five days of fabulous scenery, extraordinary accommodations, and the best wine and food the Tuscan countryside has to offer. You custom designed every aspect of our five day tour which perfectly captured the diverse interests of my wife, three teenagers, and me. You carefully selected bike routes with spectacular vistas that were not challenging, and made allowances for everyone to go at their own pace. Your companionship and camaraderie was an added bonus as well. Just got back to the States. 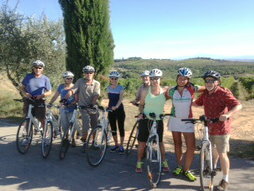 I wanted to thank you again for a wonderful bike trip on the "Florence to Siena" ride that we did with you this past tuesday. 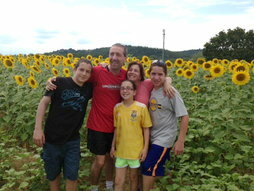 It was one of the most memorable highlights of our Italy trip. My wife and I are already talking about doing a multi day trip with you in the future. As promised attached is the photo of Amanda, Elena and I at the top of Montesenario. We had a great ride that day, I wish all my rides were as scenic! Thank you again for two fantastic trips! Here are some photos from our outing. 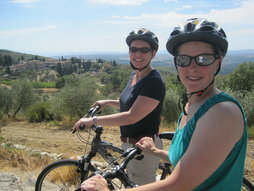 Looking forward to a future opportunity to bike with I Bike Tuscany!